First, nightcapping is not the fault of the players. They're just playing at a time they and their friends can get together. It's also not anyone's fault that there is an EU server which dramatically increases the scoring potency of nightcapping because it creates a window when anyone who would want to play, would play on the EU server rather than NA. 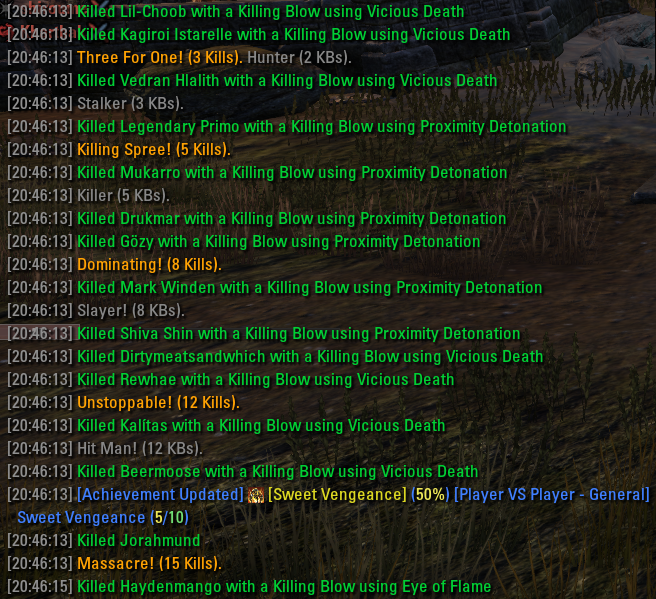 I play with a lot of folks at many times of the day (including primetime EST and AEST) and everyone I met just wanted a fun time in PvP. -Frequency for each population level should be determined by the people with the metrics to know how it affects the campaign, aka ZOS. --Example: If the server average is poplocked at 450 players for 6 hours a day, that is 2700 player hours. If it's at 1 bar 12 hours a day, then that is 1800 player hours. ((50+50+50) * 12). For easy math, let's say the last 6 hours going into and leaving primetime of 2-3 bars is a total of 1800 player hours ((100+100+100) * 6). Scoring frequency could be 9 per hour in poplocked, 6 per hour in 2/3 bars, and 3 times per hour in 1 bar times. This rewards map swings during the hardest time to change the map, but not so much that those playing in off peak times don't matter. In the above example, off peak players directly contribute to 28% of the total score in the lowest population times and indirectly by starting off in the best place during the mid-population times. This scoring can be leveraged to help the BIGGEST COMPLAINT OF CYRODIIL, LAG. Specifically, lag caused when people don't spread out. If the scoring evaluation is at a high frequency, other smaller objectives can be magnified. --Example: Reduce what a keep is worth in scoring if it doesn't hold its resources. 100% earned if all 3 resources are held, 80% for 2, 60% for 1, 40% for not owning any resources. So not protecting resources during poplocked times will cost a lot of scoring points, and with a scoring interval of 6.5 minutes, small groups can spread out and change the scoring. This is just an example of how a more frequent population-based scoring evaluation can make otherwise unneeded parts of the map really matter and not meant as the main theme of this post. This definitely sounds much better than the current system. They also need to add faction population balancing. Give the low pop factions a buff depending on the imbalance. As an example, if the difference is one bar then the buff might increase AP gained by 10% for the low pop faction, if 2 20%, if 3 40%. This will create passive faction balancing and reduce faction stacking. There is currently a low population bonus. Are you saying to change that? Yes, they need to rework it to something that comes into affect when the population bars change and is more dynamic (more bonus with bigger gap). I have never seen the current low pop bonus in effect, so I'm not sure if it actually exists in game. But I don't look that hard for it. Population imbalance will only be solved by dynamic population caps based on the lowest faction population. There is no other way. An artificial cap on population punishes the alliance that wants to PvP. I have no problem with however many want to get in Cyrodiil. If they can roll the map, do it. Just have the scoring reflect how the map looks when everyone is on. Success against other players should matter most, not when it's PvDoor. Low pop times should still matter, but not as much as the current system empowers.